In the framework of an international project, a new tunnel was excavated to study the behavior of clay formations. 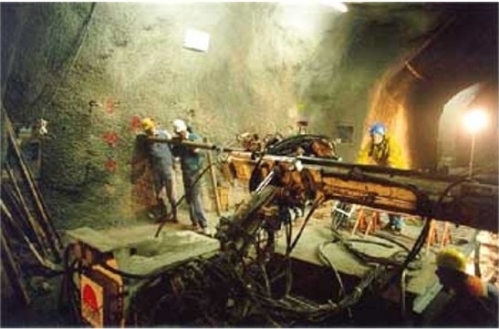 The new tunnel is parallel to an existing one at a distance of 30 m.
The main purpose of the instrumentation is to measure the rock decompression around the new tunnel. To do so, a multipoint SOFO extensometer was installed in a borehole previously created for the existing tunnel before the new one was excavated. The SOFO sensors were selected because of their reliability, precision, ease of installation and the possibility of accepting large longitudinal and lateral displacements without damage. The 9 sensors had varying gage length according to their distance from the new tunnel (4 x 25cm, 2 x 50cm, 1m, 2m, and 4m) and were pre-assembled together with an injection pipe and delivered in a coil for rapid installation. The measurements were carried out at intervals with an increasing frequency during the passage of the tunnel boring machine (TBM) near the tip of the extensometer. The figure shows the measured strains (deformation divided by the gage length) for the different sensors. Large strains were observed immediately after the passage of the TBM. 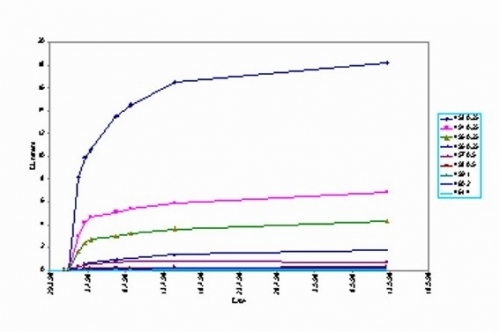 All sensors measured strains with the same qualitative trend, but with magnitudes decreasing exponentially with the distance from the new tunnel. The first sensors measured deformations in the order of 1cm/m pointing to the probable formation of cracks. The influence zone having significant deformations can be estimated to a few meters. Long-term measurements are planned on these sensors.